Tilque’s dedication and passion are apparent as he discusses how economic development efforts have improved the Valley. At its heart, economic development is about building healthy economies in order to have healthy communities. It helps communities through job creation, business retention efforts and economic diversification. Economic development success can be measured through the recognition of local products and services, increased opportunities for advancement, an increased tax base that supports, maintains and improves local infrastructure, as well as an overall improved quality of life and standard of living. Greg Tilque, senior economic development manager at the Greater Phoenix Chamber of Commerce, shared why he’s passionate about economic development, how those efforts have improved the Valley and what’s ahead for Phoenix Forward, the Chamber’s strategic approach to economic development that brings the resources of its collaborative partnerships with the Arizona Commerce Authority, the city of Phoenix and Maricopa County to the front doors of businesses. “I take pride in knowing that after companies relocate here, jobs are created, successes occurred and that I was a part of the project,” he added. Tilque is no newcomer to the economic development field. 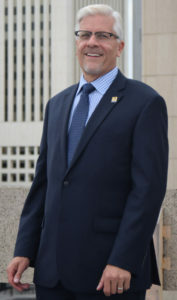 Serving 19 years as director of economic development and six years as development services director for the town of Gilbert has provided him with extensive experience in business recruitment, retention and expansion, international business attraction and redevelopment. “When I was overseeing the redevelopment of Gilbert’s downtown I really enjoyed being creative in how to make downtown a place companies wanted to be and people wanted to visit,” Tilque said. Tilque also shared some insight into CEcD certification, the industry’s gold standard for excellence in the profession. With only 1,110 certified economic developers worldwide, the achievement is highly sought after and a comprehensive designation that illustrates an enhanced knowledge and performance of those in the profession. Tilque’s dedication and passion for the Valley are apparent as he discusses how economic development efforts have improved the Valley. He also touched on the Chamber’s success with Phoenix Forward. Phoenix Forward has put the Chamber in the economic development conversation that the organization wasn’t mentioned in a couple years ago, Tilque explained. He was also excited to share what’s ahead for Phoenix Forward in 2017.